Graeme McDowell capped off an unforgettable year for himself - and for Europe. In a Ryder Cup that came down to the very last match Monday, McDowell rolled in a 15-foot birdie putt on the 16th hole, then closed out Hunter Mahan to give Europe the 14½ points it needed to reclaim the precious gold trophy. It was the first time since 1991 that the Ryder Cup was decided by the final singles match, a thriller made possible by the Americans getting big wins from its best players and a stunning comeback by 21-year-old rookie Rickie Fowler. Leave it to McDowell, the U.S. Open champion, to deliver another career-defining moment. Under far greater pressure than he faced at Pebble Beach, he turned back the American rally with a birdie putt that seemed to take forever to reach the hole until it tumbled into the cup and set off a ground-shaking roar at Celtic Manor. Europe, ahead by three points going into the final round, took the early lead in eight of the nine matches and appeared on its way to another rout on home soil. It all turned so quickly. Tiger Woods holed out from the fairway for eagle during a seven-hole stretch that he played in 7-under par. Steve Stricker won the opening match and Phil Mickelson built a big lead to win late. Then came Fowler, the first PGA Tour rookie to play in the Ryder Cup, winning the last three holes with 15-foot birdie putts to earn an improbable half-point against Edoardo Molinari. 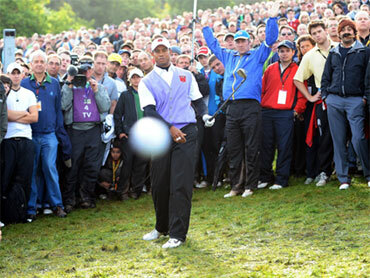 A lucky photographer was in direct line of the ball just as Tiger Woods duffed a shot Sunday. That gave the Americans 13½ points, and they only needed a halve in the last match to retain the cup. Just as Fowler was being mobbed by his teammates, Mahan made a nervy birdie putt on the 15th to cut McDowell's lead to 1 up. "The U.S. Open felt like a back nine with my dad back at Portrush compared to that," McDowell said. "I was really nervous there. Wow! It's a different feeling. It's just so much pressure." It sure didn't look that way as he blasted a tee shot down the middle and hit his approach to 15 feet, leaving him a quick putt. After a week of rain that forced the first Monday finish in Ryder Cup history, more showers soon followed - only these came from bottles of champagne sprayed in every direction. "That birdie on 16 was huge," Mahan said, choking back tears. "He beat me." Fowler and Jeff Overton, the first Americans to play in the Ryder Cup without ever having won on the PGA Tour, won key points. Overton didn't let out any "Boom, baby!" shouts, but he won three straight holes late to turn a deficit into a win over Ross Fisher. And then there was Fowler, 4 down with six holes to play, fearless as ever, closing with four straight birdies over Edoardo Molinari with one big putt after another.